Somewhere in a conversation I had picked up "... photo shoot ... all next week ... new Mercedes four wheel drive ... Joshua Tree"
When I asked about the AAV, I got the cold shoulder. It would be an exclusive shoot for only a few photographers from a hand full of VIP publications. No room for a freelancer. So the following week I went without an invitation. I drove out to Joshua Tree National Park, to bring home my own pictures of the AAV. This promised to be exciting. Finally a real off-road adventure. Locating a single vehicle in a 500.000 acre national park, would not just be a piece of cake. A real challenge! And I love challenges. For five hours I stuck my head out of the window of my car. I was looking for signs that would indicate unusual activities. My theory was, that a dirt road would normally show only tires tracks. 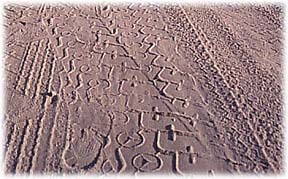 But if photographers would take pictures on one of the dirt roads (I ruled out the pavement section for a 4x4 photo shoot) there should be many shoe prints in the sand as well as tire tracks. Was I lucky! I found a spot with many prints, and not only left behind by feet.....there were also small Mercedes-stars imprinted in the dirt. No joke! 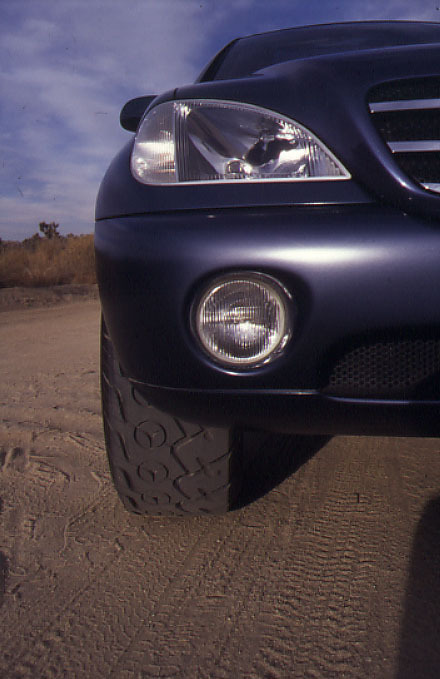 Clear prints of a tire with Mercedes emblems were noticeable in the desert sand. The photographer in me put one and one together, that I would find exactly at this spot a vehicle with star-tires at the time with optimum light (early in the morning, or around sunset). I was lucky again. My intuition was right on. Late in the afternoon the elusive AAV was ready for a portrait session. What these pictures don't really show is, how impressive this new Mercedes All Activity Vehicle is. The AAV is supposed to show the public how the expected Mercedes-Benz M-Class SUV could possibly look like. More about the AAV. A few years later I wrote a book on the new Mercedes-Benz M-Class - a perfect place to include this story of an early prototype.